After Jesus was born the Gospels mention he has a variety of visitors of which one set brought him the gifts of gold, frankincense and myrrh. Since Jesus was given three gifts it is always presumed that it was three people who came although the exact number is not stated. 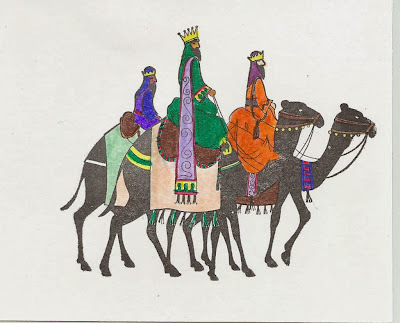 By the time they had travelled hundreds of miles by following the star to find Jesus they locate him him in a house and as a child rather than a baby. The traditional nativity scene always shows these three men present just after Jesus' birth in the stable when it fact they probably arrived when Jesus was about one year old. The Magi are also referred to as 'the Three Wise Men' and this is more likely that this is what they were. They would have been scholars in astronomy and royal advisers. Although their names are not mentioned in the Bible, in Britain and other parts of Europe they are known as Melchior, Caspar and Balthazar.